Bikers will ride to Army, Navy and RAF bases to raise cash for charity. Around 50 riders on their Harley Davidson motorbikes will complete the A-B-C ride from the Albermarle barracks, in Tynedale, to RAF Boulmer, then down to HMS Calliope on Newcastle's quayside. The all-day ride on Saturday will see bikers flying Union flags and shaking the coffers for services charity Help for Heroes as they cover almost 100 miles on the region's roads. "They have a lot of things like this down south so we wanted to do one for the North East," said organiser and Harley Davidson enthusiast John Johnston, from Ponteland, Northumberland. "Last year we had about 30 riders so we are hoping this year will be even bigger and better. "We want to raise as much money as possible for all three of the armed forces, which is why we are visiting each of their bases in the North East. "Help for Heroes is a brilliant charity which does so much good work for injured soldiers, sailors and airmen." The route, which takes in Stamfordham, Belsay, Rothbury, Boulmer, North Tyneside and Newcastle will include a lunch stop in Alnwick at around noon. 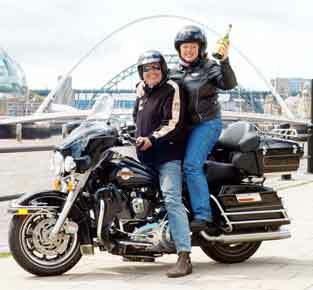 The riders expect to finish their trip at around 2pm and will then ride to the Harley Davidson dealership in Newcastle. To donate, or to buy a pin badge supporting the ride, contact John on 01661 824713.